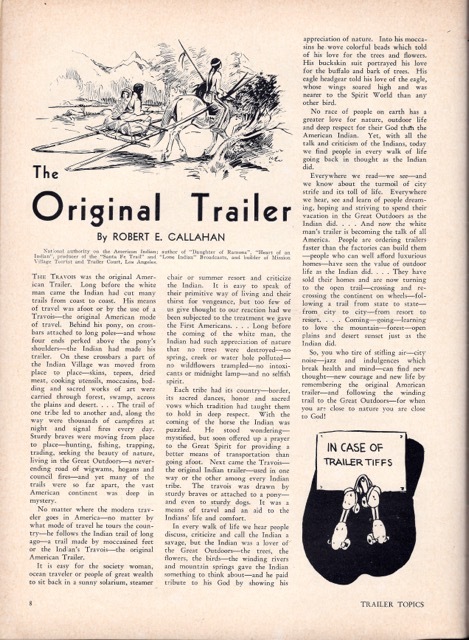 This article appeared in the very first issue of the Trailer Topics Magazine in May of 1937, page 8. 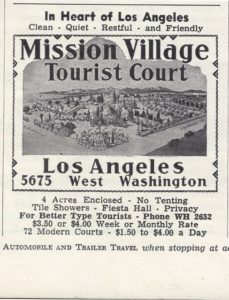 National authority on the American Indian; author of “Daughter of Ramona”, “Heart of an Indian”, producer of the “Santa Fe Trail” and “Lone Indian” Broadcasts, and builder of Mission Village Tourist and Trailer Court, Los Angeles. The Travois was the original American Trailer. Long before the white man came the Indian had cut many trails from coast to coast. His means of travel was afoot or by the use of a Travois — the original American mode of travel. Behind his pony, on crossbars attached to long poles —and whose four ends perked above the pony’s shoulders — the Indian had made his trailer. On these crossbars a part of the Indian Village was moved from place to place — skins, tepees, dried meat, cooking utensils, moccasins, bedding and sacred works of art were carried through forest, swamp, across the plains and desert. . . . The trail of one tribe led to another and, along the way were thousands of campfires at night and signal fires every day. Sturdy braves were moving from place to place — hunting, fishing, trapping, trading, seeking the beauty of nature, living in the Great Outdoors— a never ending road of wigwams, hogans and council fires—and yet many pf the trails were so far apart, the vast American continent was deep in mystery. No matter where the modern traveler goes in America — no matter what mode of travel he tours the country — he follows the Indian trail of long ago — a trail made by moccasined feet or the Indian’s Travois — the original American Trailer. It is easy for the society woman, ocean traveler or people of great wealth to sit back in a sunny solarium, steamer chair or summer resort and criticize the Indian. It is easy to speak of their primitive way of living and their thirst for vengeance, but too few of us give thought to our reaction had we been subjected to the treatment we gave the first Americans. . . . Long before the coming of the white man the Indian had such appreciation of nature that no trees were destroyed — no spring, creek or water hole polluted — no wildflowers trampled — no intoxicants or midnight lamp — and no selfish spirit. Each tribe had its country — border, its sacred dances, honor and sacred vows which tradition had taught them to hold in deep respect. With the coming of the horse the Indian was puzzled. He stood wondering — mystified, but soon offered up a prayer to the Great Spirit for providing a better means of transportation than going afoot. 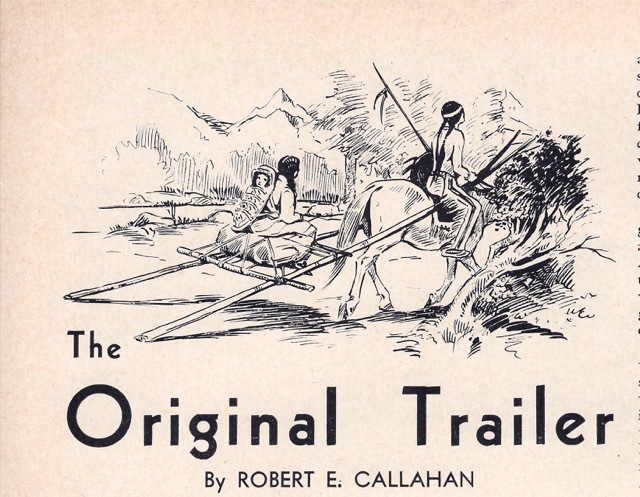 Next came the Travois — the original Indian trailer— used in one way or the other among every Indian tribe. The travois was drawn by sturdy braves or attached to a pony — and even to sturdy dogs. It was a means of travel and an aid to the Indians’ life and comfort. In every walk of life we hear people discuss, criticize and call the Indians a savage, but the Indian was a lover of the Great Outdoors— the trees, the flowers, the birds — the winding rivers and mountain springs gave the Indian something to think about — and he paid tribute to his God by showing his appreciation of nature. Into his moccasins he wove colorful beads which told of his love for the trees and flowers. His buckskin suit portrayed his love for the buffalo and bark of trees. His eagle headgear told his love of the eagle, whose wings soared high and was nearer to the Spirit World than any other bird. No race of people on earth has a greater love for nature, outdoor life and deep respect for their God than the American Indian. Yes, with all the talk and criticism of the Indians, today we find people in every walk of life going back in thought as the Indian did. Everywhere we read — we see — and we know about the turmoil of city strife and its toll of life. 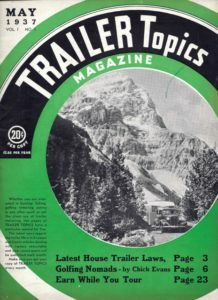 Everywhere we hear, see and learn of people dreaming, hoping and striving to spend their vacation in the Great Outdoors as the Indian did. . . . And now the white man’s trailer is becoming the talk of all America. People are ordering trailers faster than the factories can build them — people who can well afford luxurious homes — have seen the value of outdoor life as the Indian did. . . . They have sold their homes and and are now turning to the open trail — crossing and recrossing the continent on wheels — following a trail from state to state — from city to city — from resort to resort. . . . Coming — going — learning to love the mountain — forest — open plains and desert sunset just as the Indian did. So, you who tire of stifling air — city noise — jazz and indulgences which break health and mind — can find new thought — new courage and new life by remembering the original American trailer — and following the winding trail to the Great Outdoors — for when you are close to nature you are close to God! 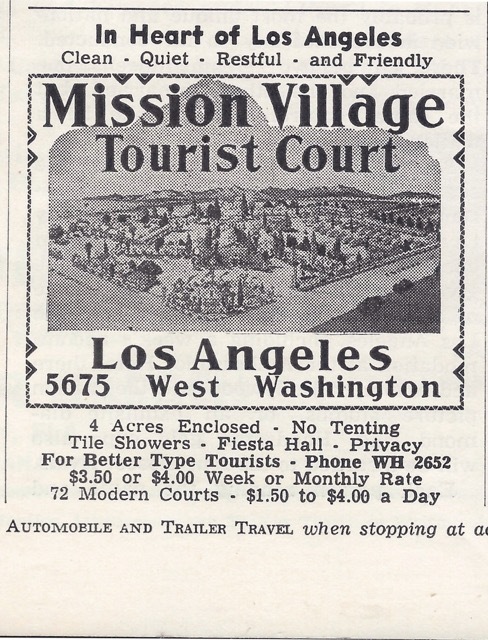 This is an advertisement for the author’s tourist and trailer court in Los Angeles which was often shown in the Trailer Travel magazines — this particular ad appeared in the November 1941 issue . . .
VINTAGE CAR! VINTAGE TRAILER! VINTAGE PEOPLE!